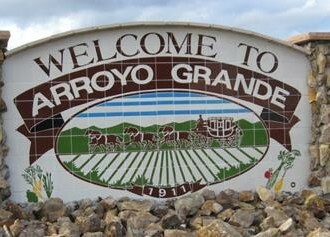 Over the next few months the City Arroyo Grande will be making one of the most important decisions about the future of our city. Our decision on a solution for the Brisco/Halcyon congestion will have a significant impact on the current and future quality of life in our community. For the last 15 plus years, we have been developing and reviewing the options. Of the two “build” options, number one would close the north-bound on and off ramps (on the east side of the freeway) with no replacement. That is similar to the temporary closure model, but the build would also significantly improve the overpass and ramps at Grand Avenue by widening that bridge, adding an extra lane to the north-bound off ramp and left turn lane, as well as aligning the south-bound ramps. At the Camino Mercado ramps, extra width and lanes would be added as well. The second option, called 4C, would close the existing north-bound ramps at Brisco Road and build new ones at Rodeo Drive. The new ramps would go into a large roundabout at Branch Street and Rodeo Drive at a lower elevation than present, realigning Branch Street away from Highway 101 into the roundabout and taking out some of the regional center parking and an associated structure. On Highway 101, there would be an extra lane from the Grand Avenue on-ramp to the new Rodeo Drive exit, and the new Rodeo Drive on-ramp would go over Brisco Road on a widened extension of the bridge. The intersection of Rodeo Drive and Grace Lane would also be realigned. The primary discussion has been the potential impact to the immediate neighborhood, and Cal Trans concerns about multiple closely spaced ramps on Highway 101. There are at least equally important considerations about expense and economic development impacts that need to be considered. In an effort to make the most informed decision possible, we have embarked on an extensive traffic study to determine how the closure of the north-bound Brisco Road on and off ramps will affect the alternative access points at Grand Avenue, Camino Mercado, and Oak Park Boulevard freeway access points, and the interconnecting city streets. There are some, including the Tribune, who think that the $100,000 we are spending on this study is a waste of taxpayers money. Considering that we could be spending somewhere north of $20 million on one of the alternatives, we are certain the investment will pay significant dividends. The primary expense and difference between this and a previous study is the data collection over a larger area and over a longer period of time. This will give us a more accurate picture of the traffic displacement caused by the closure, and with the additional time, give a more accurate impression how traffic patterns will ultimately play out. We recognize that the study will have a significant effect on some users of the interchange, although based on the closure in 2007, we may see a net improvement for most users of the interchange. Data collection is the primary purpose of the study but the real time experience of the actual users is equally valuable. We are setting up an easy way to provide your feedback after you have actually experienced the closure with a simple email brisco@arroyogrande.org. We ask your patience during this study and look forward to your input in helping us make this important decision. Jim Hill is the mayor and Jim Guthrie is a councilman of Arroyo Grande. I would like to thank Mayor Hill and Councilman Guthrie for recognizing that citizens read ALL news sources, and posting communications here on Cal Coast News. It has been a breath of fresh air how most of the new council respects it’s voters. THANKS! Whatever happened to the super-expensive (read: Walmart is paying for it) study that showed the Brisco offramp to be A-OK? I mean, were we not told that it would have a minimum impact? I take anything from a “traffic engineer” with a grain of salt. If this is “one of the most important decisions for the future of our city” and an impact on the future quality of life we are in a world of hurt. Why does the Mayor and his new sidekick have to make the hard sell for a traffic study? We are not declaring war on Pismo Beach. Try to keep up, RPO. The intersection has had a failing grade for many, many years. This means the city MUST do something to bring it up to level C or better. With Tony at the helm, and McClish left to carry his water, we have spent hundreds of thousands of $$$ (if not millions) on Brisco and if McClish has her way we’ll continue down the wasted $$$ road, chasing after an alternative we can NOT afford. It’s time to quit wasting time, and our tax dollars. Before any money is spent to facilitate city growth, how about the mitigation needed on those segments of HWY 101 that still have crossings. In Argr, Fareview to Los Baros and to the North, San Luis Obispo to Santa Margarita. There are many who have had to deal with everybodyelses growth and prosperity while Caltrans waits for the incidents and deaths to justify these needed surface roads. Hell with that mentality, why wear seat bealts until someone in your family goes through the windshield? Where is Cal OSHA when the general public needs them? How strange and unusual, a Mayor who actually goes out of his way to inform and include the public. Jim Hill for Mayor was the best vote I’ve made in a long while! One thing missing in the report — considering the cost of each change — who pays? I am confident that each Jim (Hill and Guthrie) are sincerely motivated to do the right thing for the city. The present interchange is an ugly child we have come to accept. Its rectification — when accomplished — if approved — will probably occur beyond the tenure of both proponent’s terms in office. Good report by the two Jims. A brickbat to the Tribune editorial team — always thinking small and nasty — and a bouquet of roses to the city of AG for investigating the effects of a major realignment of traffic before committing million$$ to it. This is how traffic studies should be done — testing on the ground, at full scale, using real players. Sure, a few will be inconvenienced for a couple of months, but the outcome will be better for all this way. Wouldn’t it have been better to have had better studies before the Brisco fiasco was constructed in the first place? That area is a mess — anything to clean it up will be much appreciated in the long run. Are there drawings or schematics of the various plans for the visually oriented? I’ll leave it to the traffic engineers to decide how best to conduct their studies. However, as a local driver who encountered the closure this morning with no advance warning signage, I wasn’t particularly happy. It seems to me that there should have been some warning signs along El Camino Real and South Halcyon so folks could take alternate routes before being committed to the turn on Brisco. There was postings at city hall, it was on channel 20, it was discussed at city council meetings and I also believe I read it in the Tribune. I thought the city did a great job letting residents know what was going to happen. Also with all the black monitoring strips in the roads I would think you of all people would have realized something was about to happen and maybe even called city hall to ask them. I can’t wait for something to finally get going on this project, it has been a head ache long enough. The only thing I did not expect was Jim Guthrie doing anything with Jim Hill, but hey elections are right around the corner and Jim wants to make himself look good. He did not have a clue what was happening when Tony was mayor, so know he is playing catch up. Thankfully Jim Hill was able to hit the ground running when he got elected and has continued to do a great job for the people. If there’s anything we should have all learned from the Hitchhikers Guide is that you should always, always, always stay abreast of plans posted at your local planning department in Alpha Centauri. With Jim Guthrie’s foot dragging over the years and the amount of the city’s money he help waste, no amount of “just before” election “lipstick on a swine” is going to make me vote for him. Kristen Barneich and Jim Guthrie both need to go to continue the house cleaning. You’re 100% correct. Guthrie has been on council for at least 100 years. With his reelection coming up next year, all of the sudden he’s all fired up to act like he’s a real mover and a shaker. Give me a break. Really, Jim, do you think no one noticed how tight you were with Tony? You’re one of the reasons (and votes) why we are where we are today. Can’t seem to break the Tompkins habit either…lockstep with NKT once again. Give him what he wants and things will somehow become “self correcting”. That’s about the most stupid lack of forethought we’ve heard in a long time. Can’t wait for next November, time for Guthrie and Barneich to move along. I’d read in the Trib it would be happening. I don’t have cable and have no occasion to visit city hall. My point was, advance signage is normally provided when there’s a closure. That wasn’t the case yesterday. Read it in the Trib but did not know when it would be happening, sorry the city did not send someone out to your house to inform you of the date, time ect. I drove through the intersection around noon and the cones were just going up, not sure how you had trouble this morning. It was 11:25a when I hit it and it was closed. AH poor thing, you weren’t happy, was it really that hard to find an alternate route. Stop the world MIKE BYRD did not get advanced warning. Why do you have to be so snotty, dogeatdog? Respect others comments as you would like to have yours respected.